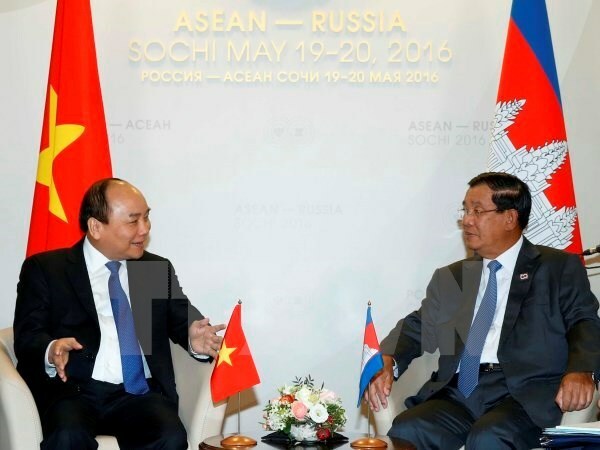 Sochi (VNA) – Prime Minister Nguyen Xuan Phuc had bilateral meetings with leaders of Cambodia, Indonesia and Myanmar in Russia’s Sochi on May 19 on the occasion of the Commemorative Summit to mark the 20th anniversary of ASEAN-Russia dialogue relations. At his meeting with Cambodian Prime Minister Hun Sen, the two leaders confirmed the priority to consolidate and strengthen the Vietnam-Cambodia good neighbourliness, traditional friendship, and multi-dimensional, long-term cooperation. They appreciated existing collaborative mechanisms, agreeing to instruct the two countries’ ministries and localities to effectively carry out signed agreements in order to further the bilateral cooperation, particularly in trade, investment and tourism. They also stressed the importance of continuing efforts to address issues related to land border delimitation and border marker planting and the legal status for Vietnamese people in Cambodia, and to settle difficulties in policies and administrative procedures for Vietnamese investors in the country. Meanwhile, during the meeting with Indonesian President Joko Widodo, both Phuc and Widodo expressed their delight at the fine development of the Vietnam-Indonesia strategic partnership. They emphasised that the two nations should continue high-ranking delegation exchanges, intensify cooperation in defence and security, strive for 18 billion USD in two-way trade in 2018, and speed up negotiations on the demarcation of the exclusive economic zone. Regarding regional issues, the leaders stressed the need to intensify solidarity and maintain the central role of ASEAN in major issues related to security and interests of each country and the region. They affirmed the importance of ensuring peace, stability, and aviation and maritime security, safety and freedom in the East Sea, while handling sea disputes based on international law, including the 1982 United Nations Convention on the Law of the Sea, implementing the Declaration on the Conduct of Parties in the East Sea (DOC) and working towards the formation of a Code of Conduct in the East Sea (COC). The Vietnamese Government leader and Myanmar President Htin Kyaw met and shared their hopes for more efforts to be made to deepen the two countries’ relations, especially in investment and trade. Speaking of Vietnamese investments in Myanmar, Htin Kyaw stated that his Government will soon consider Phuc’s proposals related to the facilitation of Vietnamese enterprises’ operations in the country, particularly in the fields of oil and gas, real estate and telecommunications. He expressed his hope that Vietnam would share its experience in agricultural production, especially in coffee and pepper cultivation and processing, with Myanmar.